At Sterchi Chiropractic, we take great pride in providing the finest chiropractic wellness care to our patients. Below is a sampling of the different chiropractic services we offer in our Yorkville office. We offer the newest technology to treat our patients. 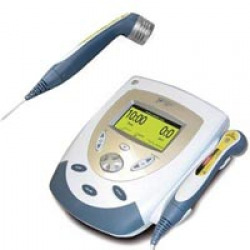 Cold laser therapy, is also known as low level laser therapy (LLLT). LLLT is being used commonly today by many professional athletic teams, olympic athletes, and many other professionals. In short, the light energy absorbed into the patient's tissue triggers biological changes at a cellular level to provide topical heating for the temporary increase in local blood circulation; temporary relief of minor muscle and joint aches, pains, and stiffness; relaxation of muscles and relief of muscle spasms; and temporary relief of minor pain and stiffness associated with arthritis. The dose and frequency of treatment can be adjusted to produce the desired effect. Low Level Laser Light has unique physical properties that no ordinary light has. This is the key to why laser light is so effective compared to other kinds of light in healing. There are more than 100 double-blind positive studies confirming the clinical effect of LLLT (Low Level Laser Therapy). More than 2500 research reports are published. Sports Injuries, Sprains, Sciatica, Radiculits, Tendonitis, Arthritis, Carpal Tunnel Syndrome (FDA Approved), Acute Neck and Back Pain, Tennis and Golfers Elbow, Chronic Pain, Plantar Fasciitis, and more. We provide specific recommendations on nutritional supplements and healthy food choices to enhance our patient´s return to optimal health. Do you know which supplements and vitamins are good for you? Our doctors can provide you with a structured nutritional program based on your individual needs.